It was a cool and gloomy morning in the mid-October woods. But despite the lack of sunshine, the timber had a glorious glow. 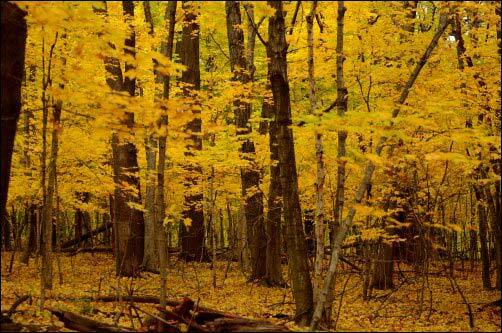 This particular area consists of mostly Maple trees and, while some red dots the landscape, it is mostly yellow that dominates the color scheme. Many leaves still cling to the trees and with the thick, lush carpet of fallen leaves on the ground, I am enveloped in a sea of yellow. It is an amazing feeling walking through the woods during this time of year. But on this day, I am on a mission. I’m hoping to find another color in my golden world, and that color is white. I come to a ridge and look into the shallow valley before me. This is one of my favorite locations, especially early in the season, to find my quarry. And there before me, I spot them. One, two, three, and a fourth, all spread only a few yards apart. All as big as soccer balls, but one, basketball in size. Calvatia gigantea in technical terms, but you probably know them better as Giant Puffballs. Big white balls of edible delicacy. They abound in these timber areas but also can be found in meadows, fields, or even your own yard. Giant puffballs are widespread and fairly common in many areas throughout the U.S. There are several varieties of true puffballs, all of which are considered edible, but it is the giants that many favor most. You might even recall the tiny puffballs that you liked to step on as a kid. Once spent and dried out you could step on them, giving off a “smoke ball” like effect, as the spores fill the air. Many found right in your own backyard. Most giants are soccer ball in size with many growing to basketball size or even larger. And of course, there will be various sizes in between, depending on when you find them. All are edible when picked at the right time of their lifespan. But how do you know for sure, you might ask. Once taken from the ground, a puffball has about a two-week edible span. This will be their immature stage when their flesh is perfect for eating. After that they will begin to rot out, making them inedible at this time. The first thing to look for is the puffball to be all white on the outside. It will look sleek and pure, easily definable when compared to a giant that is beginning to turn a more off-white, or even yellow or brown, in color. While the color of the outside (as long as it is not fully yellow or brown or later in maturity) doesn’t signify the edibility of the mushroom, the inside does. The inside flesh must be solid and all white in color. No messing around here. Cut one open and if the inside flesh is mushy or yellow or brown in color, the mushroom is not edible at this time. 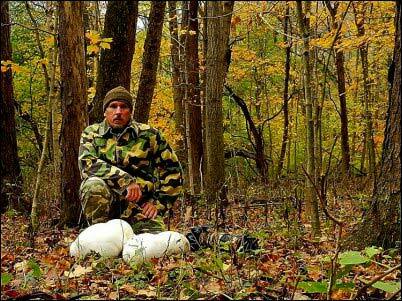 Right now is the heart of puffball season. Depending on your geographic location, puffballs will begin to appear in August and will continue to do so through October. Here in my area of Illinois, I will begin finding them in late September with the heart of growing season in mid-October. I should point out here that if you are new to the puffball game, or any edible plant for that matter, please consult an expert on identification. Never eat what you are unsure of. Get positive identification first and then eat later. So, what will you be looking for when searching for puffballs? First of all, you will be looking for a big white ball, or what appears to be a ball. Puffballs are not always perfectly round and can be in various shapes of roundness. None-the-less, they are easily identifiable from a distance. Just look for something roundish and white which might make it easier. Giant puffballs grow only on the ground and not in trees or downed logs. They grow low on the ground and have no distinct cap or stem, like a morel for example. They are light and can easily be picked without any effort. Again, the inside must be white and solid. Giant puffballs will not be gilled on the inside. There is a similar mushroom called an Earthball that will have a variety of colors (brown, yellow, purple) on the inside flesh. Just remember that a colored interior is not edible. 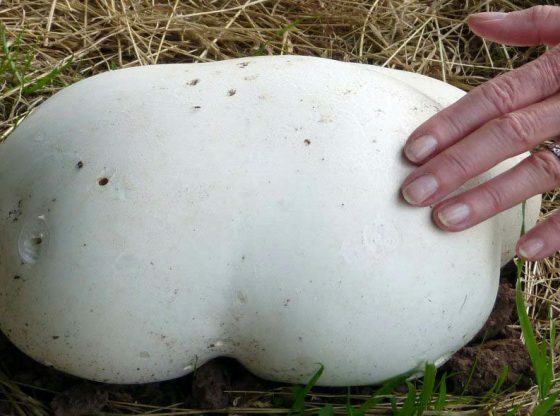 At one time, the giant puffball was considered saprotroph which means that their growth was determined by the dead organic matter around them. 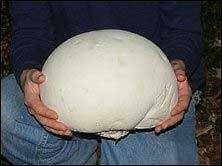 There are even a few informational websites that suggest that the giant puffball still falls under this category. Some now suggest that the giant puffball be labeled as mycorrhizal, or something grown with a relationship with the roots of plants, which I feel would be the proper category. Why? Feeding on any kind of dead organic matter would suggest that, once the right balance was determined, that we could easily grow a puffball in some kind of kit, like the morel mushroom growing kits they have out now. Now, I have never tried one of those morel kits, so I do not know if they work. But if a mushroom needed a perfect working relationship with the roots of plants, how could we match that? Has anyone ever grown a puffball? You can find all kinds of YouTube videos and articles on how to grow puffballs and you may even want to look them up. While I suppose it can’t hurt anything to try, but I feel it nearly impossible to grow your own puffballs. And why would you need to? Every fall, trillions of spores are released from a single puffball, that’s all we need. If you are more interested in the medicinal side of things, then a giant puffball has something to offer. Puffballs are known to have styptic values. That means they have an antihemorrhagic agent or something known to stop bleeding and therefore have long been used for a dressing on a wound. Slices of puffballs were put directly on a wound. So now you have gone out and found a few Giants and have determined that they are fresh and right for the eating, what do you do now? I prepare mine much like morels. Choose a breading of your choice and, instead of frying in butter, I prefer to fry in oil. Simple as that. You can also use as your mushroom of choice in many recipes while many will also use as a replacement in eggplant recipes. Finding just one giant puffball will take you a long way in the kitchen, but it will be hard to pass on others that you find. Pick a few for friends and be sure leave a few to spread their spores. Like any mushroom, you will have good and bad years. A little early moisture and decent temperatures (above freezing) will keep you supplied in fall puffballs. Collecting mushrooms during the greatest of all seasons will add to your adventure. Get out before it is to late. Happy eating.